Treasures of Troy Slots | Up to 130 FREE Spins & more! Take a trip back in time and play Treasures of Troy Slots for some very real time wins! There are loads of FREE spins up to for grabs and more! Treasures of Troy Slots has a fun Ancient Greek theme, your typical 5 reels, but an insane 1,024 ways to win in every spin! 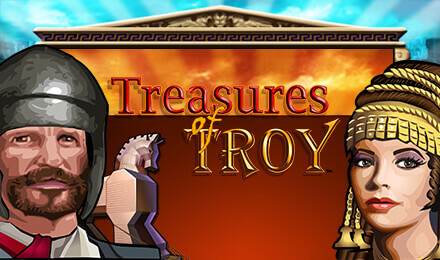 The Treasures of Troy logo is the game’s Wild, and the infamous Trojan Horse is your Scatter. Spin 3 or more Scatters to trigger your FREE spins, and any additional Scatters that are spun will get you even more FREE spins! Login and play today! Good luck!